Frey Nicolás de Ovando y Cáceres (Brozas, Extremadura, Spain 1460 – Madrid, Spain 29 May 1511) was a Spanish soldier from a noble family and a Knight of the Order of Alcántara, a military order of Spain. He was Governor of the Indies (Hispaniola) from 1502 until 1509, sent by the Spanish crown to investigate the administration of Francisco de Bobadilla and re-establish order. His administration subdued rebellious Spaniards, and completed the brutal "pacification" of the native Taíno population of Hispaniola. Nicolás Ovando y Cáceres was born in Brozas in 1460. Born into a noble and pious family, second son of Diego Fernández de Cáceres y Ovando, 1st Lord of the Manor House del Alcázar Viejo, and his first wife Isabel Flores de las Varillas (a distant relative of Hernán Cortés), Ovando entered the military Order of Alcántara, where he became a Master (Mestre or Maitre) or a Commander-Major (Comendador-Mayor). This Spanish military order, founded in 1156, resembled the Order of Templars, with whom it fought the Moors during the Reconquista. His elder brother was Diego de Cáceres y Ovando. As Commander of Lares de Guahaba Ovando became a favorite of the Spanish Catholic Monarchs, particularly of the pious Queen Isabella I. Thus, in response to complaints from Christopher Columbus and others about Francisco de Bobadilla the Spanish monarch on September 3, 1501, appointed Ovando to replace Bobadilla. Ovando became the third Governor of the Indies, the Islands, and the Province of Tierra Firme (Mainland province). Thus, on 13 February 1502, he sailed from Spain with a fleet of thirty ships. It was the largest fleet that had ever sailed to the New World. The thirty ships carried around 2,500 colonists. Unlike Columbus's earlier voyages, this group of colonists was deliberately selected to represent an organized cross-section of Spanish society. The Spanish Crown intended to develop the West Indies economically and thereby expand Spanish political, religious, and administrative influence in the region. Along with him also came Francisco Pizarro, who would later explore western South America and conquer the Inca Empire. Another ship carried Bartolomé de las Casas, who became known as the 'Protector of the Indians' for exposing atrocities committed by Ovando and his subordinates. Hernán Cortés, a family acquaintance and distant relative, was supposed to sail to the Americas in this expedition, but was prevented from making the journey by an injury he sustained while hurriedly escaping from the bedroom of a married woman of Medellín. The expedition reached Santo Domingo in April 1502, and included Diego de Nicuesa and Lucas Vazquez de Ayllon. Also on board were 13 Franciscans, led by Friar Alonso de Espinar, bringing the total on the island to 25. When Ovando arrived in Hispaniola in 1502, he found the once-peaceful natives in revolt. Ovando and his subordinates ruthlessly suppressed this rebellion through a series of bloody campaigns, including the Jaragua Massacre and Higüey Massacre. Ovando's administration in Hispaniola became notorious for its cruelty toward the native Taíno. Estimates of the Taino population at the time of the arrival of the Spaniards in 1492 vary, with Anderson Córdova giving a maximum of 500,000 people inhabiting the island. By the 1507 census, according to Bartolomé de las Casas battlefield slaughter, enslavement and disease had reduced the native population to 60,000 people, and the decline continued. In 1501, Ovando ordered the first importation of Spanish-speaking black slaves into the Americas. Many Spanish aristocrats ordered slaves to work as servants in their homes. However, most slaves were sent to work in the sugar cane fields, which produced the valuable cash crop. After the conquests made by his lieutenants including Juan Ponce de León and Juan de Esquivel, Ovando founded several cities on Hispaniola. 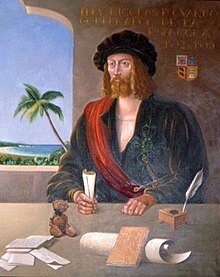 He also developed the mining industry, introduced the cultivation of sugar cane with plants imported from the Canary Islands, and commissioned expeditions of discovery and conquest throughout the Caribbean. Ovando allowed Spanish settlers to use the natives in forced labor, to provide food for the colonists as well as ships returning to Spain. Ovando also allowed the Taíno to be exploited for their labor, and hundreds of thousands died while forced to extract gold from the nearby mines. Pursuant to a deathbed promise he made to his wife Queen Isabella I, King Ferdinand II of Aragon recalled Ovando to Spain in 1509 to answer for his treatment of the native people. Diego Columbus was appointed his successor as governor, but the Spanish Crown permitted Ovando to retain possession of the property he brought back from the Americas. Ovando died in Spain on 29 May 1511. He was buried in the church of the former monastery of San Benito de Alcántara, which belonged to his military order and which sustained significant damage in later centuries. ^ Noble David Cook, "Nicolás de Ovando" in Encyclopedia of Latin American History and Culture, vol.4, p. 254. New York: Charles Scribner's Sons 1996. ^ "Latino Chronology: Chronologies of the American Mosaic"
^ Ovando made Hernán Cortés a notary and awarded him a land grant nonetheless. This started Cortés' career as a conquistador. ^ Floyd, Troy (1973). The Columbus Dynasty in the Caribbean, 1492-1526. Albuquerque: University of New Mexico Press. pp. 53–54. ^ Karen Anderson Córdova (1990). Hispaniola and Puerto Rico: Indian Acculturation and Heterogeneity, 1492–1550 (PhD dissertation). Ann Arbor, Michigan: University Microfilms International. This page was last edited on 29 March 2019, at 00:37 (UTC).